"Dr. Whitford is cross-appointed in the Department of Physician Assistant Studies and the Department of Emergency Medicine," said Paul Allen, Sr., DSc, MPAS, PA-C, assistant professor, program director and chair of the Department of Physician Assistant Studies. Whitford served 26 years in the U.S. Army, where he was a Special Forces medic during Vietnam War and a physician assistant (PA), also with the Special Forces. He served as medical director of the PA residency program at the Brooke Army Medical Center when it became a doctorate program. 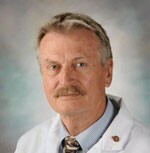 Whitford joined the Department of Emergency Medicine at UT Health San Antonio in 2003. He noted that his experience as a PA gives him a perspective well-suited to his new role as medical director. "I am a former PA so I understand where PAs come from, I understand their knowledge base and I understand how much they add to the emergency department and medicine in general," he said. Allen said he is looking forward to Whitford's impact. "I think having been a PA and practiced as a PA he is more acutely aware of the advantages the PA brings to the healthcare team," Allen said. "I think he can act as an ambassador for the program within other departments (at UT Health San Antonio) as well as in the hospital."